Carla’s life of color started on the 14th of January 1976 in Pretoria, South Africa. Spring’s flood of purple in this city could have inspired Carla’s bold use of color. 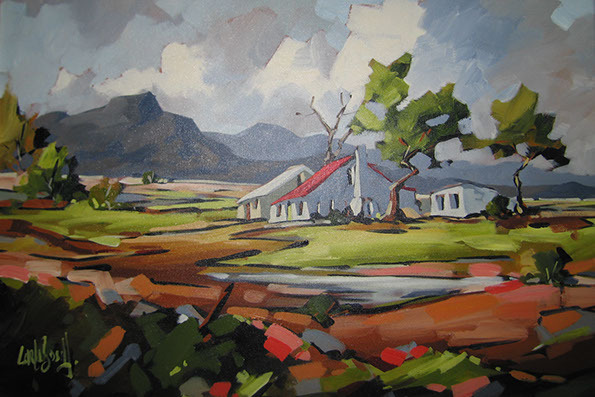 After finishing an Interior Design Diploma at the Tshwane University of Technology (1997), Carla’s love for painting took over. Hard work paid of as numerous prominent art galleries requested her work. Most of these top galleries remain loyal supporters to this day. Painting is not Carla’s first love. She is madly in love with her husband Elroy and is a devoted mother to their two children, Sarah and Daniel. It’s from this loving environment that Carla’s work brings homeliness to any space. The warmth and cheerfulness of her landscapes, boats and street themes are true to Carla’s vibrant personality and her giving nature is evident in the liberal use of bright acrylics and oils. She possesses a unique ability to create amazing scenes taking you to places where you’ve always wanted to be. From the glorious landscapes of Southern Africa to the street scenes of ancient Europe, all inspires Carla to share her impressions of beautiful places with you. Carla has spent many hours studying the work of old masters and young artists alike. It is Carla’s desire to be an ever developing artist. She embraces every opportunity to interact and learn from other artists. While Carla’s work finds its way all over the world, she and her family now reside in California, USA.